DLR stands for Docklands Light Railway and it is an automated light rail system used in parts of London. It's a pretty good system, from what I can tell, but hey I'm not from around there so not sure what Londoners think of it. Plus I have never used the MetroRail here in Austin, so I'm not really qualified to offer a professional opinion on the matter. But I digress. On my recent trip across the pond, I had the good fortune to spend an entire day shooting new and interesting parts of London (new to me, that is) with Mike Murphy (my 2nd time to shoot with him, actually) who in addition to being a great tour guide is also a wonderful photographer. It's great to have a local photographer guide you around. While they know the best spots to shoot, they also know how best to get there, and how to figure out which train on the DLR goes where...and which Tube stops to take... and which bus to take when the Tube line is down. So, thanks Mike! I appreciate that! 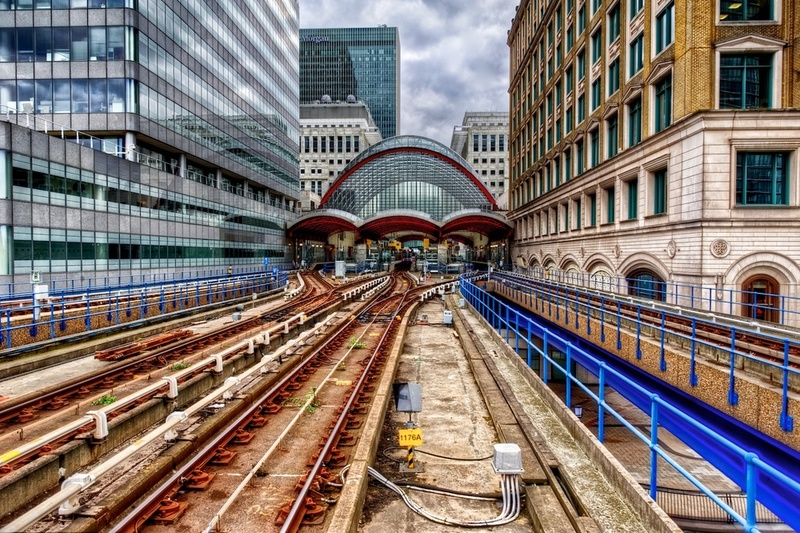 This shot was taken at the Canary Wharf station, which Mike recommended we visit, and I am glad we did. It's pretty awesome looking in my opinion, but I am partial to these sorts of things. We all have our weaknesses, I guess. I went a little grungy on the processing on this one, but it is a train station and that just conjures up a little grunge in my mind. How about you?